In 2004 , I was chased out of the water by a large Great White shark, while surfing at Muizenberg with friends. It took nearly 10 minutes to alert all surfers and clear the line up. I decided then that something had to be done. A system was needed to protect people in the water, and at the same time to educate the public and Conserve the shark. I started a grass roots project I called the Sharkspotters. With the help of Dave & Fiona Chudliegh and a few other, we ran it for 18 months with community support and funding, 2 spotters , donations and fundraising. 10 years later, we are recognized and sort after as experts and ground breakers on White shark Data , knowledge and Conservation. We are a registered NPO, with over 35 spotters (on rotation)on 8 beaches in the Western Cape. We have also pioneered the worlds first retractable exclusion net (Fishoek) and are now working with the KZN Sharksboard on experimental Electrical field deterrents. 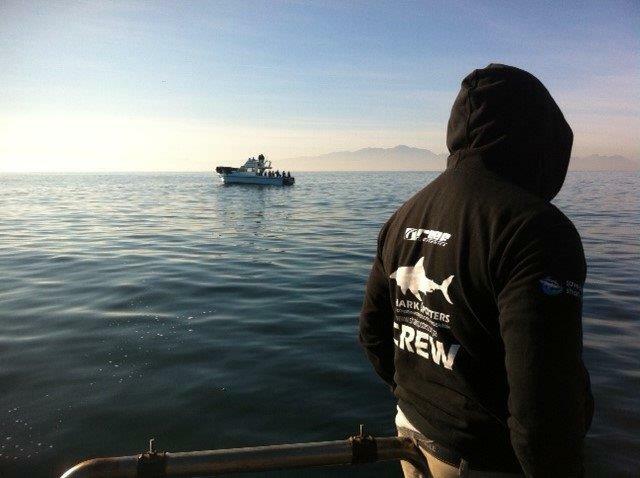 We are supported and funded by Save Our Seas and The City of Cape Town. I remain as Chairman of the Steering committee and work closely with the amazing Alison Koch, Sarah Warries , Alan Welburn , Gregg Oelofse, Howie Gold, Monwa Sikiya and more. Before 2004, what was a sharkspotter? No such thing existed. We changed perceived reality, and created a Conservation, Education & Protection Non Profit Organisation we called, Sharkspotters. We save lives, protect sharks and have collected and collated more data on Great White Sharks, than any other Project anywhere in the world, over the past 10 years.